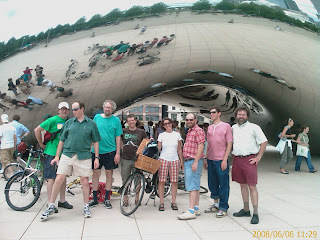 Last week in Chicago big city advocacy groups met to discuss bicycling issues that affect big cities. A big topic of discussion focused around challenges in the next Congress, specifically the transportation authorization bill and the climate change issue. Secondly was a brainstorming session on joint campaign ideas, bike for your independence and bike the vote in November. Stay tuned for more details as these campaigns are launched. Photo: The Urban Bike Caucus in front of the Cloud Gate sculpture in Millennium Park near the McDonalds Cycle Center (Bike Station). From Left to Right - Paul Steely White - Transportation Alternatives, Jeffrey Miller - Thunderhead Alliance, Randy Neufeld - Chicagoland Bicycle Federation, Scott Bricker - Bike Pittsburgh, Leah Shahum - SF Bike, Rob Sadowski - Chicagoland Bicycle Federation, Noah Budnick - Transportation Alternatives, and BCGP Executive Director Alex Doty. Scott Bricker is the ED for the BTA in Portland Oregon, not Pittsburg. unbelievable, there's TWO scott bricker's who are both ED's at bike advocacy orgs in PDX and P-burgh. My bad dog. Unbelievable indeed, we call them Scoot (Pittsburgh) and Brick (BTA).